Computing the period of a meteor using two ways. Computing the period of a meteor using two ways. Astrophysics discussion. 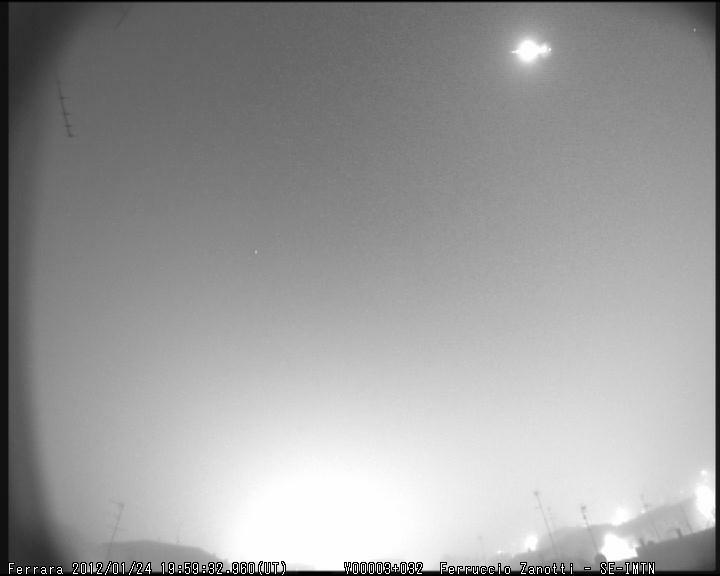 28Jan2012 June Cook Newtown, PA 21:40:00 4 sec NE, toward NJ and NY bright white Very bright, beautiful Yes. Larger than other shooting stars I've observed. 28JAN2012 Vincent McManus Queens, New York, USA 21:35 EST 4 Sec NW to SE (Southern Sky) Bright White/Faint Orange ball with long White Tail Moon No parts (single object) Appeared to be traveling on approx heading of 100 degrees. Very bright, long tail. Spotted while heading South approaching Whitestone Bridge (NY). Visible in Southern sky traveling right to left (NW to SE) over Queens & Western Long Island. Heading approx. 100 degrees. High visibility. Clear sky at time of sighting. 28Jan2012 Kim Romanchuk New Market, MD, USA 21:42, EST ~3 seconds slight north to south, headed mostly straight down to earth surface. orange/yellow fireball with long tail Hard to compare - small sun not that I could see seen while driving east on I-70. 28JAN2012 Brian Union, NJ, 07033 21:45pm EST 3 sec South, right to left White Venus No parts falling off Was moving really fast was pretty big did not look like a fire ball it was very white colored and I wish there were not trees in my way because it definitely reached the ground. 28JAN2012 Trish Johnson Jenkins Montross, VA 22520 9:44 PM EST Less than 20 seconds Start East Traveled to the right Bright Yellow and Teal with a long tail...was huge!!! Not like the shooting stars I have seen. Moon...I don't know how bright Venus is I don't think so...it happen so fast! It was beautiful!!! If anyone got a picture I would love to have one. Please share. 28JAN2012 Carla New York, NY USA 22:00 EST 5 sec W-E; right to left at around a 45degree angle bright white brighter than moon & venus no was like a larger, slower moving shooting star. was pretty awesome to see! 28JAN2012 Alexis Fair Lawn, NJ, USA 21:55:00 2 seconds falling diagonally and left-wards bright ball of fire about equal to an uncovered lightbulb (but tiny) no I was facing NW. It looked like something was falling out of the sky. 28JAN2012 Giles Nowlan Riverside 21:45:00 5 seconds United States Green Smaller than the moon but larger than venus Yes Meteorite was falling from the sky toward the ground. Was extremely bright green and fizzled out well before it would have contacted the ground which was a couple degrees above the tree line on the horizon. Looked as if sparks were falling off of it (little orange sparks). Was amazing looking, glad I was driving home and got a chance to see it. 28JAN2012 Morrisa Vollmerhausen Columbia, Maryland, USA 21:30:00 About 10 seconds, maybe a little less East Looked like falling from the sky and pieces falling from it. Golden color. Like a sparkler in the sky Yes Was driving down the road on 175 in Columbia, my husband and I both saw it in the sky. Looked like something was falling from the sky but too slow for a shooting star. Pieces were falling from the tail of it. Disappeared after a few seconds. Brooklyn, New York arrived from google.com on "Latest Worldwide Meteor/Meteorite News" by searching for falling star nyc today. Bronx, New York arrived from google.com on "Latest Worldwide Meteor/Meteorite News" by searching for asteroid over long islsnd. Whitestone, New York arrived from google.com on "Latest Worldwide Meteor/Meteorite News" by searching for did anyone just see the metoer in queens. Baltimore, Maryland arrived from google.com on "Latest Worldwide Meteor/Meteorite News" by searching for green shooting star seen ten minutes ago. New York arrived from google.com on "Latest Worldwide Meteor/Meteorite News" by searching for did a shooting star just fall over nyc?. Fredericksburg, Virginia arrived from google.com on "Latest Worldwide Meteor/Meteorite News" by searching for something just fell from the sky virginia. Centreville, Virginia arrived from google.com on "Latest Worldwide Meteor/Meteorite News" by searching for meteor shower on saturday january 28 2012. Berlin, Maryland arrived from google.com on "Latest Worldwide Meteor/Meteorite News" by searching for recent meteor strikes. Paoli, Pennsylvania arrived from google.com on "Latest Worldwide Meteor/Meteorite News: OT: Just Breaking News -Japan Earthquake 5.2+ 28JAN2012" by searching for meteor 1/28/12. Any other sighting reports? Please report: Date and Time of event? Location name (town,city) where you were when saw the meteor? Start and Stop location in sky? Direction of movement? Duration of Event (seconds)? Brightness ( in comparison with Venus, Moon, Sun) color, sounds? Photos? Videos? Artwork? See the Report Button at the top sidebar. Your reports make it possible for all to check what they saw as well. Thank you! Based on multiple eyewitness accounts of the UFO, it was most likely a meteor or bolide falling from the sky and burning up in the Earth's atmosphere. The dramatic appearance of meteors or bolides makes them commonly reported by witnesses as UFOs. Latest Worldwide Meteor/Meteorite News. 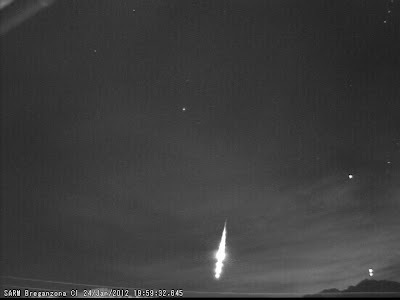 Fireballs, Meteors, Bolides, Meteorites, Comets, Asteroid Impact,Meteorite Quest, Recent Meteorite Falls & Related News. Make a meteor report. 433 Eros is a near-Earth asteroid (NEA) discovered in 1898, and the first asteroid to be orbited by a probe (in 2000). It is an S-type asteroid approximately 34.4×11.2×11.2 km in size, the second-largest NEA after 1036 Ganymed, and belongs to the Amor group. Eros is a Mars-crosser asteroid, the first known to come within the orbit of Mars. Objects in such an orbit can remain there for only a few hundred million years before the orbit is perturbed by gravitational interactions. Dynamical integrations suggest that Eros may evolve into an Earth-crosser within as short an interval as 2 million years, and has a roughly 50% chance of doing so over a time scale of 108–109 years. It is a potential Earth impactor, believed to be larger than the impactor that created the Chicxulub Crater that led to the extinction of the dinosaurs. AWB Asteroid Eros Parallax Project 2012 Begins As EROS Passes Earth! Asteroid Eros Parallax Project Begins As EROS Passes Earth 2012! Tonight many amateur astronomers and school classes are eagerly awaiting the asteroid Eros, now at its closest to Earth. From January 28 to February 3 they will take an image of Eros either through a telescope or with a telephoto lens. 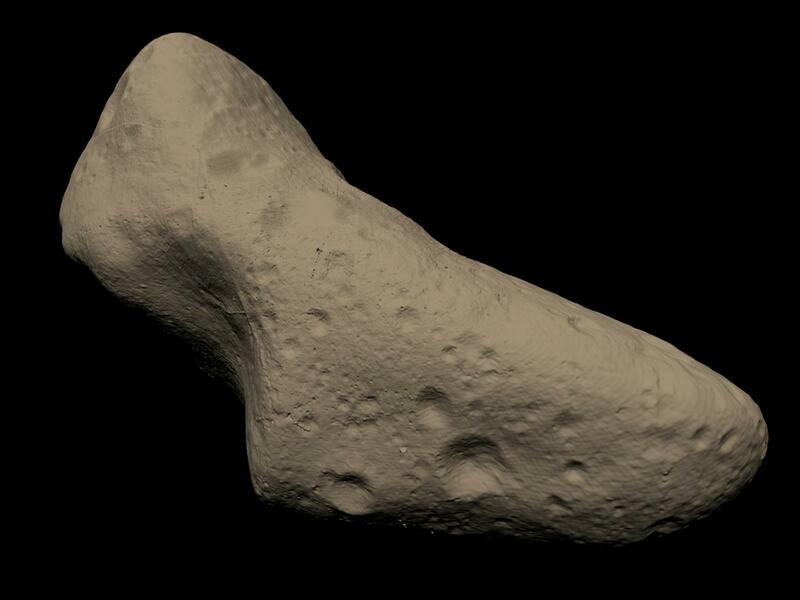 Photographs of Eros submitted by amateur astronomers around the world will show slight differences in the asteroid’s position due to parallax. Along with each observer’s location, this parallax information will be used to find a precise distance to Eros, just like professional astronomers did in January 1931. The Eros Parallax Project is first and foremost fun to take part in. You don’t have to be an experienced astrophotographer to be able to make valuable observations. An ordinary SRL camera with telephoto lens, mounted on a tripod, could be enough. Using free, online software you will determine the celestial coordinates of Eros on your images and submit the data to the project website. With the data submitted by you and the other participants, the distance to Eros will be calculated. The instructions on the project website are clear and simple to follow. The Eros Parallax Project is also a great educational opportunity; the data and submitted images will be made available for classrooms to use to find the distance themselves. This resource will last forever, and will certainly inspire some young astronomers to take part the next time Eros comes close to Earth again. It will also prepare classrooms for the even rarer event coming in June – the transit of Venus. Along with enjoying the night sky, developing observing skills and gaining an understanding of our solar system, participants and the students who benefit will repeat the work of the professional astronomers of the 1930s and learn about real research. See the Eros Parallax Project web page for more information on how to take part. Be ready for more meteors, fireballs and bolides as this asteroid will have accompanying debris. Get out and observe, cameras ready; there may just be some activity in your area. We need your sighting reports to confirm; please submit a report. Thank you. Fort Worth, Texas arrived from google.com on "Latest Worldwide Meteor/Meteorite News" by searching for what was the green light in the sky tonight in north texas. Richardson, Texas arrived from google.com on "Latest Worldwide Meteor/Meteorite News" by searching for meteor over dallas. Round Rock, Texas arrived from google.com on "Latest Worldwide Meteor/Meteorite News" by searching for green light in the sky, january 26. United States arrived from google.com on "Latest Worldwide Meteor/Meteorite News" by searching for january 26, 2012 meteor dallas texas breaking news. Arlington, Texas arrived from google.com on "Latest Worldwide Meteor/Meteorite News" by searching for meteor over north texas, 01-26-2012. Euless, Texas arrived from google.com on "Latest Worldwide Meteor/Meteorite News" by searching for 26 january 2012, falling green lights. Plano, Texas arrived from google.com on "Latest Worldwide Meteor/Meteorite News" by searching for meteor seen in texas. 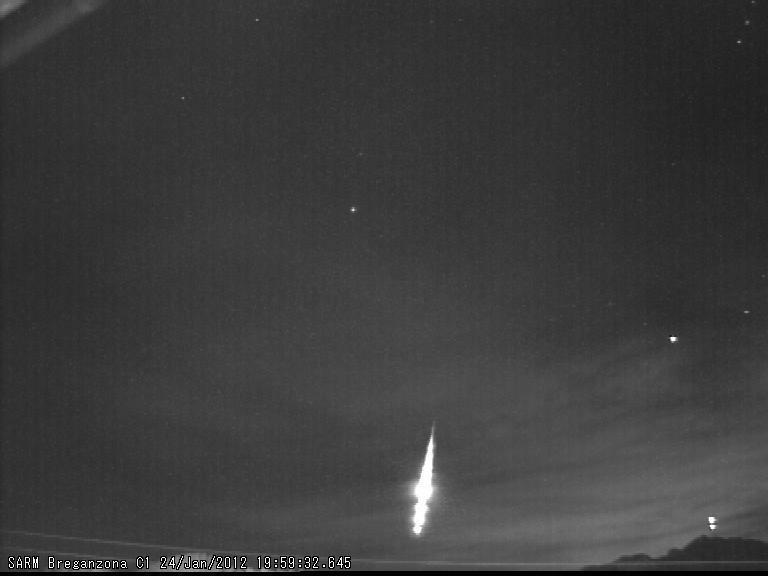 Denton, Texas arrived from google.com on "Latest Worldwide Meteor/Meteorite News: Texas Green Fireball Meteor ~10:35 CST 12MAR2011" by searching for meteor dallas. Brown University camera catch fireball in the sky. Concorde was not flying again, a meteorite had not collided with Earth and there was no jumbo jet nose-diving toward the ground, despite what you may have heard. Oman Astronomical Society hosts the 10th Conference of the Arab Union for Astronomy and Space Sciences (AUASS) in cooperation with Ministry of Transport and Communications, the International Astronomy Union (IAU), National Aeronautics & Space Administration (NASA), European Space Agency (ESA) and the Foreign Office for Outer Space Affairs (UNOOSA), the inter-Islamic network for space science and technology (ISNET), and The Research Council, 12-15 Rabeea al Awal 1433 corresponding to 5 to 8 February 2012 Muscat - Sultanate of Oman. The Tenth Conference of the Union comes under the theme"The Role of Astronomy and Space Sciences in Developing Contemporary Societies"
The Arab Union for Astronomy and Space Sciences is an NGO Arabic Astronomical Astronautical Authority based in Amman/Jordan , (AUASS) which was formally established in 1998.
" دور علوم الفلك والفضاء في تطوير المجتمعات المعاصرة"
الإتحاد العربي لعلوم الفضاء والفلك (AUASS) هيئة فلكية فضائية عربية غير ربحية وأحد الاتحادات النوعية التابعة لمجلس الوحدة الاقتصادية العربية التابع للأمانة العامة لجامعة الدول العربية، مقره مدينة عمان في المملكة الأردنية الهاشمية ، تأسس رسمياً سنة 1998. By Genalyn Corocoto | January 26, 2012 12:39 AM EST A new study by geologists from Curtin University revealed proof of meteorite collisions on the Moon as evidence by the mineral zircon from lunar rock samples recovered during NASA's Apollo missions. I just stepped out onto my deck for a few minutes to give my dog a nature break and looked due South just in time to see a very nice meteor above the trees. Meteor Flashes, Monster Fireballs, Mystery Boom and Earth Tremors ... not so strange with an open mind. Mon Jan 16 13:13. % of readers think this story is Fact. Although Mike Brightmore, secretary of the Cleethorpes and District Astronomy Society, said: "If it had been a meteor, it would have been accompanied by a bright streak across the night sky. As far as I am aware, no one has reported seeing one. Research led by Curtin University geologists has uncovered a wealth of new evidence in the mineral zircon from lunar rock samples recovered during NASAâs Apollo missions, revealing indisputable proof ofmeteorite collisions on the Moon. ASU currently owns the largest institutional piece of the martianmeteorite Tissint. Photo by: Laurence Garvie.